Ono Bowls or Oh-No Bowls? The acai joint doesn’t deserve the accolades. Bright, delicious and trendy, acai bowls are the epitome of the antioxidant aesthetic. Ono Bowls on Eighth Street, a favorite among NYU students, floods social media feeds. Apart from its convenient location and free Wi-Fi, Ono Bowls offers a large variety of oatmeal, smoothies and bowls with fruit, acai and pitaya. I wondered if the bowls would fulfill my fruity desires. Entering the store, I was immediately struck by the vibrant decor and — for lack of a better description — hipster vibe. The stress-relief coloring books and magazines strewn all over the wooden bar, the bold mural and patterned couch, the chalkboard menu and fresh kombucha and cold brew on tap immediately gave me high expectations. My expectations only grew when I took a look at the extremely varied and exciting menu, offering bowls like “Oh MY Nuts” and “GINGER WILDE.” After great deliberation, I ordered the “THIN MINT” bowl ($10). “Taste like a Girl Scout Cookie, but no Guilt.” While I was not expecting the fruit to be magically transformed into a delectable dessert, the bowl did not live up to any other average acai.The granola was sharp and grainy. The mint was also barely detectable, making me question why they named it after the classic Girl Scout Cookie in the first place. The bowl’s sweetness-to-ingredient ratio seemed off due to the bitter cacao nibs that contrasted with the saccharine honey, which created chaos in my mouth. It was by no means unsalvageable, but after a few bites, I was simultaneously left wanting more and unwilling to finish. While the bowl was overall a bore, I surprisingly really enjoyed the extra Macnella topping I chose as an add-on, which is a healthier alternative to Nutella. It was just as chocolatey, rich and buttery as the real deal. However, the sheer variety on the menu is impressive. 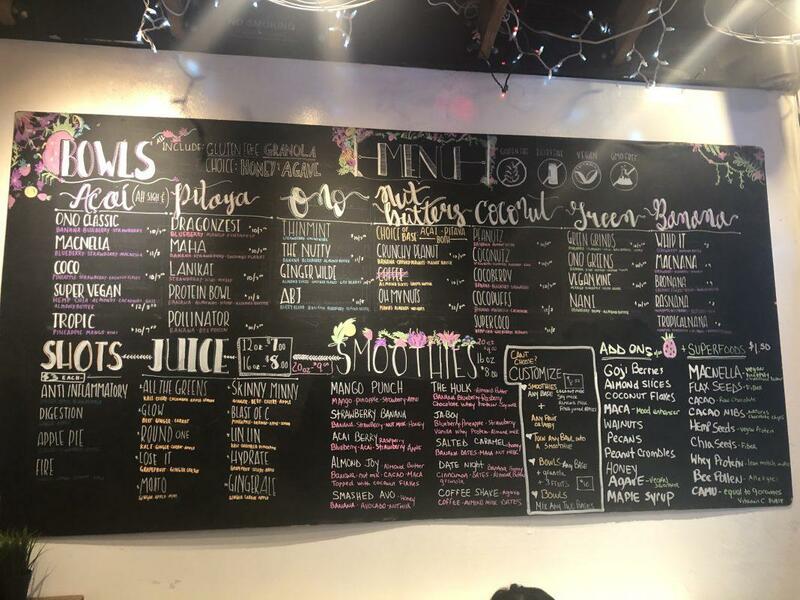 Ono Bowls offers classic breakfast foods like toast and oatmeal, as well as offerings of fruit bowls, smoothies and juices that are typical of juicers and smoothie shops. The menu was also inclusive of different dietary needs like vegan and gluten-free provisions and offered great add-ons and alternatives to some of the unhealthy toppings sometimes found in acai bowls. While Ono Bowls is a fun and chic spot with plenty for health-conscious customers, I’m going to stick to Playa Bowls on MacDougal Street for my acai fix.